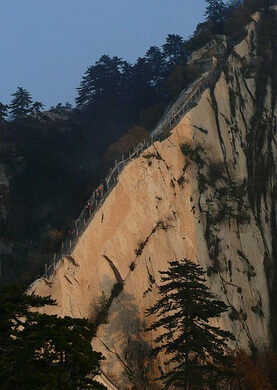 Many Chinese still climb to the North Peak of Huashan Mountain at night. This centuries-old tradition stems from trying to avoid fear. Many believed it was easier to climb to the peak if the ground was hardly visible in the darkness of night. Rock-cut caves and 7,000 Buddhist sculptures carved into the nearly sheer face of a sandstone mountain. 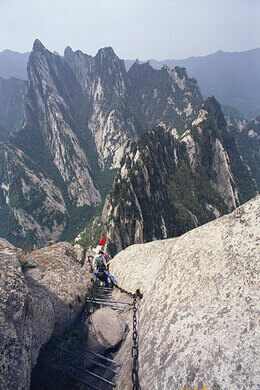 Although Huashan takes no climbing expertise to ascend, it is considered the most dangerous hike in the world. 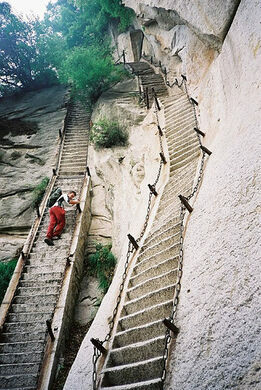 To reach the North Peak, stone steps have been carved from the mountain at an impossibly steep incline. Although technically a set of steep stairs, the way up the peak is more akin to a ladder, requiring a slow and deliberate climb. On both sides of the treacherous steps are chains, which are the only safety precaution available to climbers.but the road is wide,your safety can be ensured. 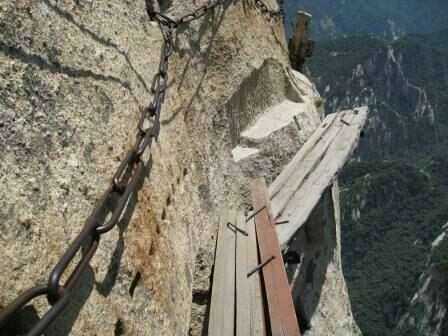 While the climb to the North Peak is only meant for the boldest visitors, the most dangerous hike available on Huashan is a horizontal climb from the North to the South Peak. The trek actually follows a narrow wooden outcropping next to the cliff face, barely wide enough to accommodate two feet in hiking boots. Once again, only a chain stands between the climber and a mile-high drop off. Over the years, the trek between peaks has claimed the lives of many visitors, causing Chinese authorities to work to improve safety on the peaks. 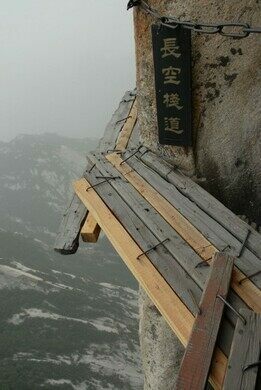 Despite the dangers, people have been climbing to the North Peak for over 2000 years, and Huashan is regarded as one of the most sacred Taoist mountains in China. It is believed that spirits and a god live on the mountain and on many parts of the mountain, there are small Taoist shrines and temples frequented by pilgrims and hermits. 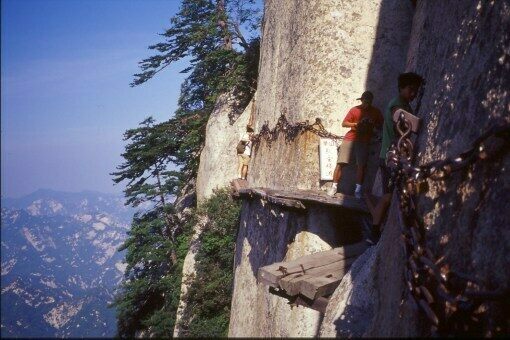 The dangers of hiking Huashan are very real, and visitors should take precaution when climbing. Visiting during the winter months can also be treacherous due to ice and snow on the steep climb to the North Peak.